Hap after his memorable flight with sponsors from Consolidated Freightways. "Blackie" Blackburn is fellow member on Sallyann's B-29 web site. He was member of 499th Bomb Group of 73rd Wing based on Saipan in 1944-45. Flew his 35 missions. He was flying along side our plane V square 27 when we were knocked down on high altitude mission against Tokyo (target 357) on 1/27/45. "Blackie" has been closely associated for many years with the CAF and FIFI on her summer tours throughout the country. On February 4, 2006 he posted roughly as follows to site members. ''Hap Halloran is member of Commemorative Air Force, and has made a number of appearances on summer tours of Fifi and our B -24. He has served as Docent and also conducted cockpit Tours in various cities over many years. Over the years we have invited Hap a number of times to join us for a ride on Fifi but he never accepted... 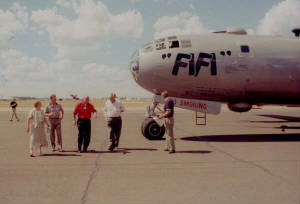 Finally in 2001 while Fifi was appearing in Spokane Hap finally accepted the CAF invitation to ride on Fifi - this was 56 years later from the day he parachuted from his B-29 over Tokyo. " Blackie suggested I respond to tell site members my feelings about that day. I did not respond to his question/suggestion, but I thought about his request many times in the interim. After a morning scheduled meeting at my home this morning with a former Japanese Navy officer from Tokyo, I switched to watch the Golf match play Tournament at LaCosta. Not too exciting so checked in on the B 29 site. Several E Mail exchanges caught my attention. The topic centered along the lines of "did any of our B 29ers (or other planes) flyers or ground personnel from WW II or Korea experience any qualms about flying again after the Wars ended and they returned to civilian life. I respect the feelings and decision of anyone who elects to eliminate flying from their personal lives. Over the last 56 years I have flown almost 5 million commercial domestic and international miles. Then why did I hesitate and not accept a ride on B 29 Fifi when offered over many years. Now I was ready to board Fifi. There was somewhat of a feeling of anxiety pre boarding Fifi at Spokane- running the props thru as we did on Saipan in 1944 -45. Climbing into Fifi 56 years later was more difficult than on Saipan in my days of youth. I took the seat at the Navigator desk. I felt comfortable there; pretty much at home. The sound and vibration and the white smoke as the engines were cranked up reminded me of days of long ago. Now we were taxiing to take off position. We were soon into the take off roll on the runway. Soon we were airborne. This was a PRESS flight; a normal flight for publicity purposes at each City on the tour. TV and Radio and newspaper personnel loved those B 29 rides and always accorded excellent publicity to assure large crowds at the airport during the week that Fifi would be there in their city. As we cruised over the beautiful lakes and terrain in the Spokane area I somehow had a strange feeling - something was not normal - not as I recalled in the days of War. Our crew in training and combat days was known as "The Rover Boys Express" Now I knew why my strange different feeling. My WW II crew members were not there in their usual positions. 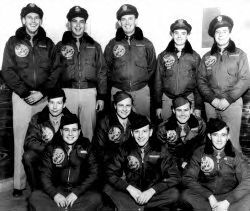 Strangers of the Press group were occupying some of the seats or merely standing or sitting close to where real life "Rover Boys" Bobby Grace and Jimmy Edwards and Guy Knobel and Willie Franz and Snuffy Smith were always close by in the front section of our B-29. I thought of them and I also thought of Vito Barbieri and and Tony Lukasiewicz and John Nicholson and Bobby Holliday and Cecil Laird in the rear section of our B 29. Our crew members were from 11 different states. I thought of and missed all of them on that flight over Spokane that day. None of them are with us now. Six did not survive on enemy soil that long ago day. Five have passed on since repatriation on August 29, 1945. We were lining up for our landing at Spokane. We touched down gently. Mission complete. My first ride on a B 29 in 56 years was memorable in several ways. I looked back as we walked away from Fifi. because all of "The Rover Boys" could not also be there.